Another Kate Spadefull price code! Save 25% off regular price with 4NOVAFF25 thru Monday, 11/25 –> Tuesday, 11/26. ETA: Code did expire on Mon, 11/25. 2 park avenue beau ($498) – The Kate Spade bag of FA13. Look at that bow. I don’t see this color online. I love the cipria, which is like the ballet pink color. Pale. Very pretty. I like this bag a lot. It does feel a bit big, even for a big bag lover. I think the boxy shape makes it a little awkward for me to carry. I try to factor in being able to carry it with ease while managing Mini G, but that’s proving to be unrealistic in general. We’re in a I can do it! stage, so I have to have my hands absolutely free. I’ve even been nixing the couple of crossbody styles and putting my debit card & id on my person before going in stores with her. I do not need another tote bag or anything else for that matter. Nevertheless, I’m in trouble every time they have a surprise sale. 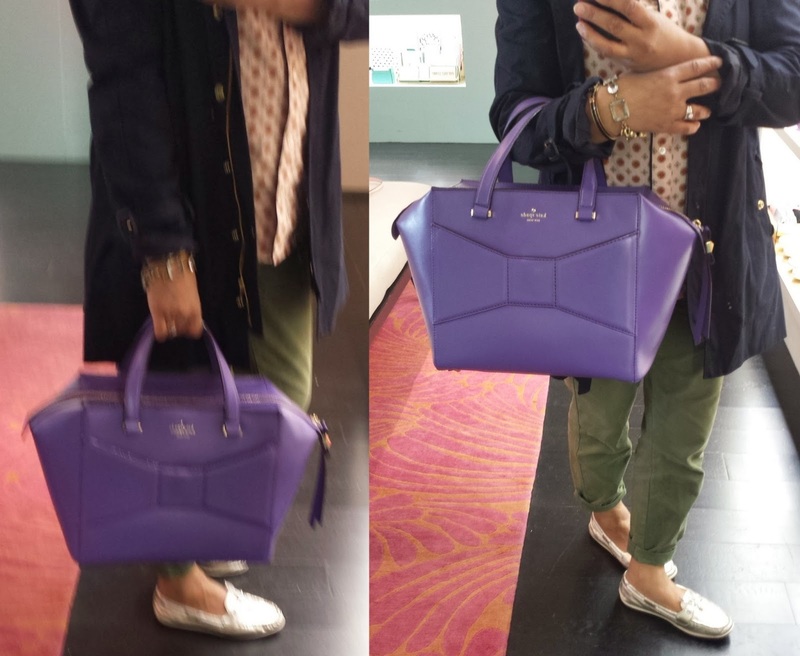 I love this bag! I also tried the 2 park avenue small beau ($398 no pics) . My mom said no to that one. I love going out with her, but sometimes her opinion sticks in my head. She is trying to help me not shop, so she’s very picky with her thumbs ups when I ask. I have a feeling I could’ve shown this to her and she might’ve thought it was cute. Whereas when we’re in the store… The mini beau felt even boxier than the regular beau, but I liked the tinier shape. All I know is I really want something in cipria or ballet pink, so I’ll have to figure out what it’ll be. 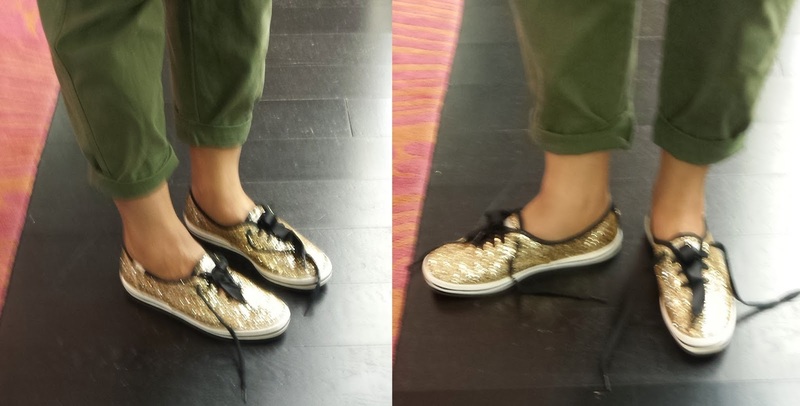 Keds for kate spade new york glitter kick ($80) – If you love glitter, these are almost a must. I wear 7.5 and initially tried on 7 as that’s what was on the sales floor. I was able to try on the 7.5 and that felt 100% for sure comfortable. I decided to stick with 7.5 since I sometimes wear 8. If I wanted to wear a sock or if my feet were to swell, the 7 might not feel that comfortable. If you have a narrower foot, consider sizing down one. If you have a medium foot with a rectangular shape like mine /no tapering toward the toe, or if you have a wider foot, take your usual shoe size. All that glitters emanuelle ($328) – The bow and the text are rose gold. I’m a gold-gold kinda gal, but I would be happy to make an exception for a cute clutch like this. It has a box frame shape, so no fluidity. You won’t be able to get a lot in it, but you’re supposed to be having fun when you carry it. Not hunting for lost items in the abyss of your gargantuan tote. All that glitters gia ($78) – The author, Dorothy Parker, is quoted. I love a martini, but two at the most. Three I’m under the table. Four I’m under the host. This also comes in a bon shopper ($158). Leroy street glitter georgie ($128) – Glitter and sequin shine always captivate. I liked this one. Wise owl clutch ($378) – My mom liked this a lot. It’s quirky, yet very cool looking. I am loving all the Pop, Fizz, Clink items and anything with the Bubbles on it. But I think the Seaport Watch in Rose Gold is one of my favorites. 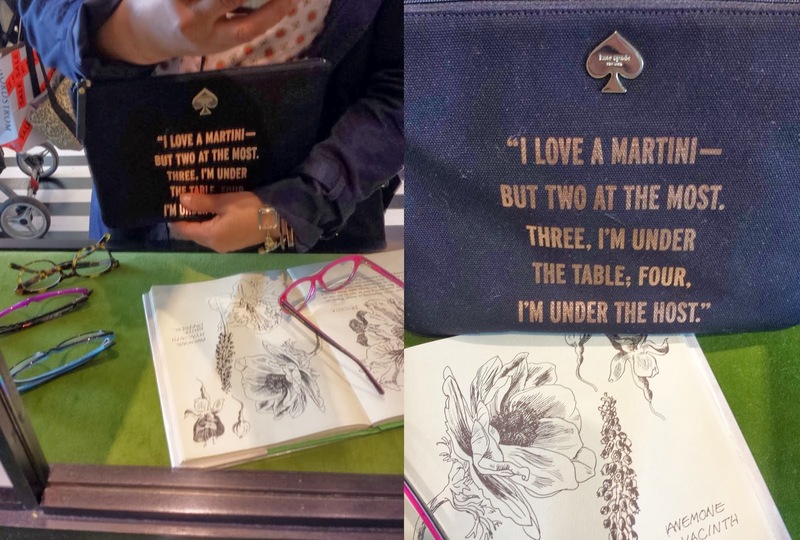 I saw the Owl Clutch in-store last month and loved it. It's certainly a conversation starter. 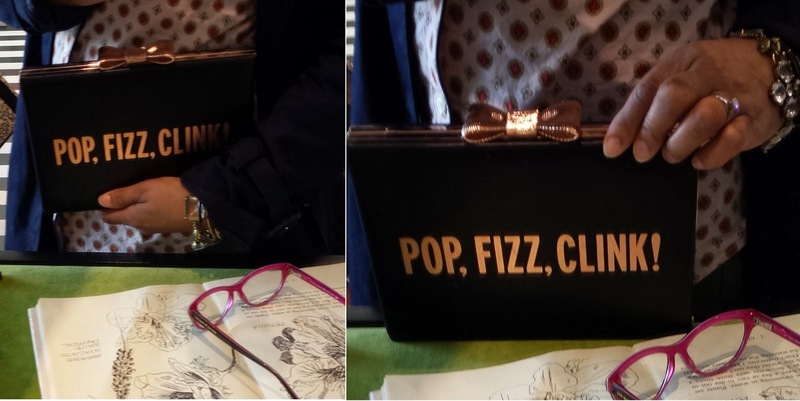 audreybella – I just got the pop/fizz/clink coin purse today. Will review for tomorrow, I hope. I'll check out the watch. There's a rhinestone one I loved in-store, but haven't really looked at their watches closely. You were right the first time. Code ended yesterday. I've finally figured out that ebates gets the end dates wrong. Always 1 day late. Must be the 11:59 ending time on codes. I was so mad at the end of last month when I missed the code. But I've got it now. Hollylovesjcrew – I didn't know that about ebates. I usually go off of the retailer's emails. However, I got the code from another source and thought I might've gotten the end date incorrect. I think I saw it on another site and saw the 11/26 like you did. I guess we'll both just have to not wait till the last minute if we want to bite. 😉 I usually shop KS right away if there's a code and I want something, Particularly during the flash sales. Normally I don’t read article on blogs, but I would like to say that this write-up very forced me to try and do so! Your writing style has been surprised me. Thanks, very nice post. Magnificent goods from you, man. I’ve remember your stuff prior to and you’re just too excellent. I actually like what you’ve acquired right here, certainly like what you are saying and the way by which you assert it. You make it entertaining and you still care for to keep it sensible. I cant wait to learn far more from you. This is actually a tremendous web site. Simply wish to say your article is as astounding. The clarity in your post is simply nice and i can assume you are an expert on this subject. Well with your permission let me to grab your feed to keep up to date with forthcoming post. Thanks a million and please keep up the rewarding work. I am not sure where you’re getting your info, but great topic. I needs to spend some time learning more or understanding more. Thanks for wonderful information I was looking for this information for my mission. Good day I am so grateful I found your blog page, I really found you by accident, while I was browsing on Aol for something else, Nonetheless I am here now and would just like to say many thanks for a fantastic post and a all round exciting blog (I also love the theme/design), I donít have time to go through it all at the minute but I have book-marked it and also included your RSS feeds, so when I have time I will be back to read more, Please do keep up the awesome job. Pretty section of content. I just stumbled upon your site and in accession capital to assert that I get actually enjoyed account your blog posts. Anyway I’ll be subscribing to your augment and even I achievement you access consistently fast. I simply want to say I am just all new to weblog and truly loved you’re blog site. Probably I’m planning to bookmark your website . You absolutely come with impressive stories. Kudos for sharing your website page. I just want to say I am just new to blogging and site-building and seriously loved your page. Likely I’m likely to bookmark your blog post . You really come with really good posts. Thanks for revealing your web page. I just want to say I am all new to blogging and certainly liked this website. Most likely I’m likely to bookmark your website . You certainly come with beneficial articles. Thanks for sharing your website page. I just want to tell you that I am just new to blogging and really loved you’re web page. Most likely I’m want to bookmark your site . You surely have superb articles. Bless you for sharing with us your website. I simply want to mention I am very new to blogs and honestly liked this web site. More than likely I’m likely to bookmark your blog post . You surely have fabulous articles. Cheers for sharing with us your blog. I simply want to mention I am just beginner to blogging and site-building and actually savored this blog site. Very likely I’m planning to bookmark your site . You really have remarkable well written articles. Regards for sharing your blog site. I simply want to tell you that I am new to blogging and site-building and certainly savored you’re web site. Likely I’m want to bookmark your site . You actually come with perfect stories. With thanks for sharing with us your website. Someone necessarily lend a hand to make seriously articles I would state. This is the first time I frequented your website page and to this point? I amazed with the analysis you made to create this particular publish incredible. Magnificent activity! I simply want to tell you that I’m all new to blogs and seriously liked your web-site. Probably I’m going to bookmark your blog post . You surely have outstanding writings. Bless you for revealing your webpage. Hello, Neat post. There is an issue together with your website in web explorer, may test this¡K IE still is the marketplace leader and a huge element of people will omit your magnificent writing due to this problem. I simply want to tell you that I am new to blogging and truly liked this web-site. More than likely I’m going to bookmark your blog . You absolutely come with awesome article content. With thanks for sharing with us your web-site. Hey there! Do you know if they make any plugins to help with SEO? I’m trying to get my blog to rank for some targeted keywords but I’m not seeing very good results. If you know of any please share. Cheers! you are in point of fact a good webmaster. The web site loading velocity is incredible. It kind of feels that you are doing any unique trick. Moreover, The contents are masterwork. you’ve done a great process in this topic! I just want to say I am just all new to blogs and certainly liked this web page. Probably I’m planning to bookmark your website . You absolutely have exceptional well written articles. Thanks for sharing with us your webpage. I just want to tell you that I am just all new to blogs and honestly savored this blog. More than likely I’m going to bookmark your blog . You certainly have excellent well written articles. Regards for revealing your blog site. whoah this blog kalysdi is fantastic i love reading your articles. Keep up the great work! You know, a lot of people are searching around for this information, you can help them greatly. Hey There. I found your blog using msn. This is an extremely well written article. I will be sure to bookmark it and return to read more of your useful info. Thanks for the post. I’ll definitely comeback. Love this place. I’ve been here at least 1/2 a dozen times with friends from work. This time I brought my 7 year old son. He loves it. Hello, Neat post. There’s a problem along with your website in web explorer, may check this¡K IE still is the marketplace chief and a good element of people will omit your great writing due to this problem. Hi, Neat post. There’s an issue with your site in web explorer, would check this¡K IE still is the marketplace leader and a large component to folks will pass over your magnificent writing because of this problem. I like the helpful information you provide in your articles. I’ll bookmark your weblog and check again here regularly. I’m quite certain I’ll learn many new stuff right here! Best of luck for the next! Hello this is kinda of off topic but I was wondering if blogs use WYSIWYG editors or if you have to manually code with HTML. I’m starting a blog soon but have no coding expertise so I wanted to get guidance from someone with experience. Any help would be enormously appreciated! An impressive share! I have just forwarded this onto a co-worker who has been conducting a little research on this. And he actually bought me lunch due to the fact that I discovered it for him… lol. So let me reword this…. Thank YOU for the meal!! But yeah, thanx for spending the time to discuss this subject here on your site. I have been checking out a few of your articles and i can claim nice stuff. I will surely bookmark your blog. I must express my appreciation to this writer just for rescuing me from this particular setting. Right after checking throughout the the web and getting views that were not pleasant, I was thinking my entire life was over. Being alive without the answers to the difficulties you have sorted out by means of your entire article is a serious case, as well as the ones that would have badly damaged my career if I had not come across your blog post. Your personal talents and kindness in maneuvering the whole lot was invaluable. I’m not sure what I would’ve done if I had not encountered such a subject like this. It’s possible to at this moment look ahead to my future. Thanks for your time very much for the expert and results-oriented guide. I will not think twice to suggest the sites to anyone who desires direction about this matter. Hello! I just would like to give you a huge thumbs up for the great information you have got here on this post. I am coming back to your blog for more soon. You made some nice points there. I did a search on the issue and found a good number of persons will agree with your blog. Thank you for sharing excellent informations. Your site is so cool. I am impressed by the details that you have on this site. It reveals how nicely you understand this subject. Bookmarked this website page, will come back for extra articles. You, my friend, ROCK! I found just the information I already searched all over the place and simply couldn’t come across. What a perfect web-site. Thanks so much for giving everyone remarkably terrific chance to read from this web site. It’s always very pleasant and jam-packed with a good time for me and my office fellow workers to search the blog on the least three times weekly to learn the latest things you have got. And of course, I am just always contented for the brilliant ideas served by you. Some 2 ideas on this page are basically the most effective we have all ever had. Greetings! Very helpful advice in this particular post! It’s the little changes that will make the most important changes. Many thanks for sharing! Wow! This could be one particular of the most beneficial blogs We have ever arrive across on this subject. Actually Fantastic. I’m also a specialist in this topic so I can understand your effort. This excellent website certainly has all of the info I needed concerning this subject and didn’t know who to ask. hello there and thank you for your info – I have definitely picked up anything new from right here. I did however expertise a few technical points using this website, as I experienced to reload the web site a lot of times previous to I could get it to load properly. I had been wondering if your hosting is OK? Not that I am complaining, but slow loading instances times will sometimes affect your placement in google and can damage your high-quality score if ads and marketing with Adwords. Anyway I’m adding this RSS to my email and could look out for much more of your respective fascinating content. Ensure that you update this again soon.. I have been checking out many of your stories and it’s nice stuff. I will surely bookmark your site. I seriously love your site.. Very nice colors & theme. Did you build this website yourself? Please reply back as I’m wanting to create my very own website and would love to know where you got this from or what the theme is named. Many thanks! When I initially left a comment I seem to have clicked the -Notify me when new comments are added- checkbox and from now on each time a comment is added I get 4 emails with the exact same comment. Is there a means you are able to remove me from that service? Appreciate it! Enjoyed studying this, very good stuff, appreciate it. “To be positive To be mistaken at the top of one’s voice.” by Ambrose Bierce. F*ckin’ awesome issues here. I’m very satisfied to peer your article. Thank you a lot and i am looking ahead to contact you. Will you please drop me a e-mail? Howdy, I do believe your web site may be having internet browser compatibility problems. When I look at your web site in Safari, it looks fine however when opening in IE, it’s got some overlapping issues. I simply wanted to give you a quick heads up! Aside from that, wonderful site!